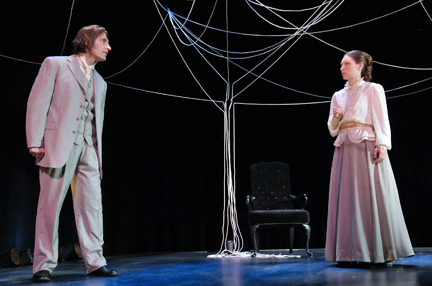 Stoneham Theatre will present "The Turn of the Screw" from October 21 - November 7. Directed by Caitlin Lowans, the production stars Ryan Landry and Molly Schreiber (below). As unexpected occurrences turn sinister and ghostly visions intrude, she vows to protect the children at all cost, even as it becomes apparent that she is really the one in need of protection. The ghostly duet written by Jeffrey Hatcher and based on the novella of the same name by Henry James strips the scary tale down to its raw elements. With minimal sets and no props, Hatcher's distillation offers a fresh perspective on the haunting nineteenth century story while providing a chilling tour de force for the two actors, one of whom plays multiple roles. Without succumbing to special effects, Hatcher’s adaptation relies on the narrator, the master of the house, to tell the tale. Language is key to generating the play’s heightened atmosphere, posing the ultimate challenge for both actors and their listening audience. Ryan Landry is a playwright (currently a Huntington Theatre Company Playwriting Fellow) and entertainer, most notably affiliated with the Gold Dust Orphans, a Boston and Provincetown-based fringe theater company founded in 1995 by Landry and others. Molly Schreiber holds a BFA from Tisch School of the Arts at NYU and has performed in many Boston-area productions including Paula Vogels’s "A Civil War Christmas" at the Huntington Theatre Company. Her film / TV credits include "Edge of Darkness" with Mel Gibson. She is also a Mainstage Company member at Improv Asylum in the North End. Fridays, October 22, October 29, and November 5, at 7 p.m. prior to the performance. Join expert mediums Mary D’Alba and MaryLee Trettenero who will share with Stoneham Theatre-goers the pleasant and unpleasant realities of communicating with the spirit world. Event is free to that day's ticket holders. Sundays, October 24, October 31, and November 7, following that day’s 2 p.m. matinee. Join Caitlin Lowans, along with Ryan Landry and Molly Schreiber, for hot fudge sundaes while engaging in a lively and educational discussion of the play. Event is free to that day's ticket holders. For tickets and information, stop by the box office at 395 Main Street in Stoneham, call 781-279-2200 or visit www.stonehamtheatre.org.